CNN reports that a popular inflatable pool slide, sold by Wal-Mart and Toys R Us, has been recalled due to deaths and severe injuries. 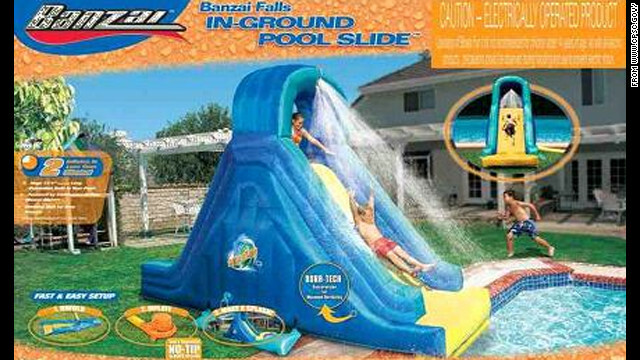 The U.S. Consumer Product Safety Commission has order the recall of the Banzai Splash inflatable pool slide. The slide can partially deflate, causing serious injuries. At least one death and one incident of paralysis have been reported. Additionally, the slide is unstable and carries inadequate warnings and instructions. If you or a family member has been injured as a result of using one of these slides, please call our office immediately for a consultation. You must act quickly to protect your rights. Contact us at 1-800-557-8176 or click here.